Thankfully, libraries have great comics collections these days. Sometimes I’ll go to my local one and pick up a few random Trade Paperbacks. There’s not necessarily an order to what’s on the shelves, but it’s a good opportunity to grab something I’ve been meaning to read for a while, or something that I’m curious about. My last two choices fall in to the latter category. 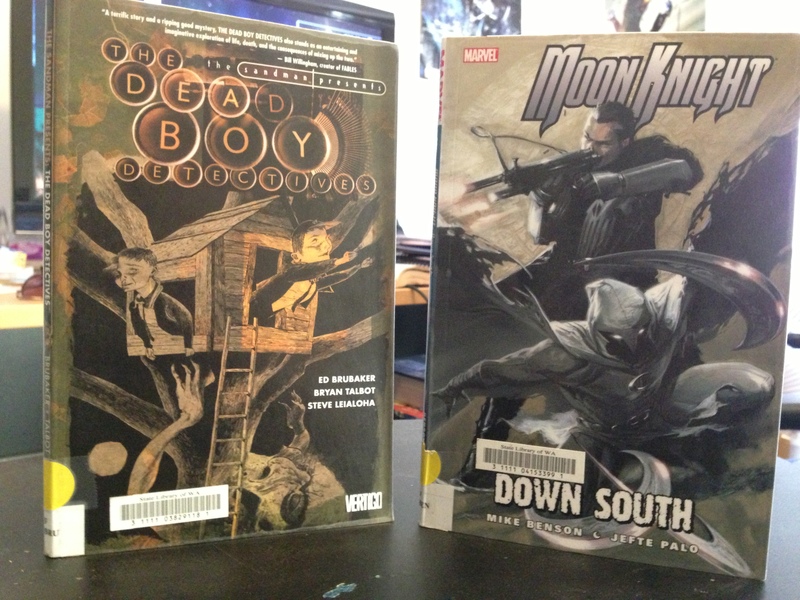 Moon Knight: Down South collects issues 26-30 which are the final issues of the 2006 series. I don’t know a lot about Moon Knight, and many compare him to the closest thing Marvel has to Batman, which is understandable.The character has been around since 1975 but has some things that set him apart from his fellow superheroes. Namely, his great white costume, the fact that he has multiple personalities (and secret identities! ), and has lunar/mystic theme to his identity and powers. I’ve read very little of the character, but I know the basics, but for anyone unfamiliar with Moon Knight, this will tell you what you need to know. Wiki will help too. 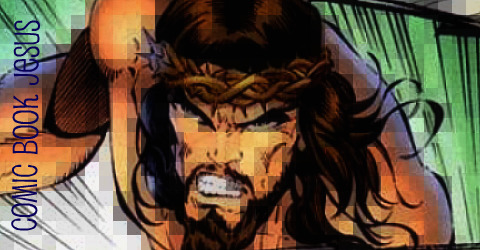 There is a recap page which tells you about the events leading up to this, but essentially, MK is on the run and has “killed” one of his identities and is hiding out in Mexico. This was a surprisingly good read. Written by Mike Benson, and with art by Jefte Palo, this was a thoroughly enjoyable read. MK hardly appears in costume, until the end, and despite the cover, The Punisher only shows up for a few pages too. Most of this tale is focused on Jake Lockley and a job he’s been given, to rescue a Mexican land mogul’s daughter from some corrupt cops. Everyone isn’t who they seem, and the two luchadore brothers are a great addition, and have real personalities. They could’ve been an annoying gimmick, but Benson makes them work, and Palo grants them great visuals, plus the amazing covers of the original issues by Gabriele Dell’otto are included here. (Mexican wrestling masks, Kevlar vests, and big guns). This is grim, bloody (but not overly so) and mature. There are a lot of adult themes and blanked out profanity here, but it’s all a great reminder that Moon Knight is an interesting character, as hopefully his latest series launch by Warren Ellis and Declan Shalvey will show when it debuts in March. The Dead Boy Detectives are a spin-off from Neil Gaiman’s legendary and long running fantasy series, Sandman, also from DC Comics/Vertigo. 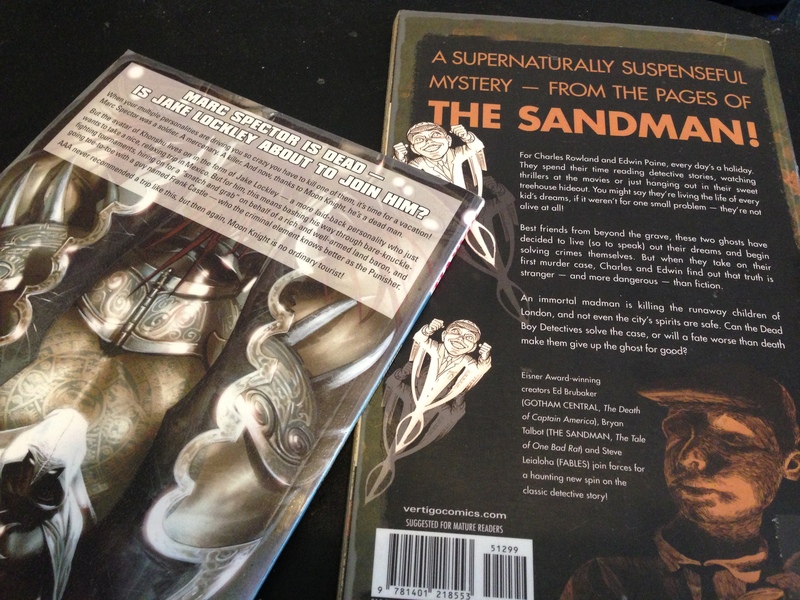 This collection, called The Sandman Presents: The Dead Boy Detectives, gathers the original 2001 four issue mini-series. This is their first series, and is written by Ed Brubaker with art by Bryan Talbot. They’re obviously a pair of popular characters, as their new ongoing series just launched. The child amateur sleuths are tow boys who choose to remain on Earth after dying a century ago, rather than depart for the afterlife. Charles Rowland and Edwrad Paine are bets friends, who occasionally bicker, but also have a sense of wonder, a desire to be like their fictional heroes such as Sherlock Holmes, and a disregard for the “rules” of being a ghost, as the rotund apparition of Mrs Blumfield tells them of for. In this tale, the pair are tasked by a young female runaway to investigate mysterious deaths of her homeless friends around the banks of the Thames. 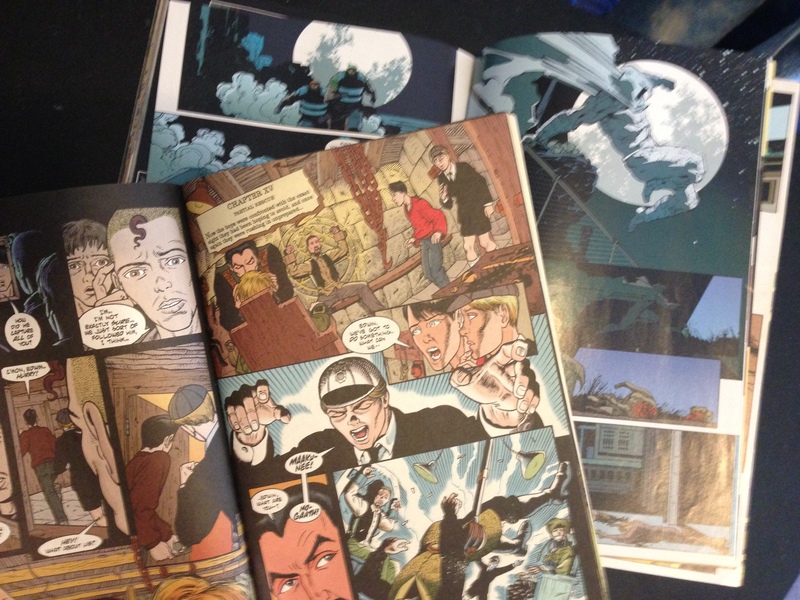 Set in modern London, the boys’ old sense of fun and duty is a good contrast, although more could’ve been made of it, but Brubaker certainly writes them as children in a charming manner. Edwin’s dress sense (an old boarding school uniform) is a great touch too. As they dig deeper in to the mystery of the suddenly aged corpses, and meet a man known as the Marquis, whose history dates back to ancient France, the clues start to make sense. The goateed Marquis also teaches the boys how to perform astral projection and takes them out for a night on the town, focused on hunting for the prime suspect. Most adults can’t see them, but those who can are interesting characters in their own right, such as the old, one-eyed sailor Chippy and Mad Hettie. It’s a concise adventure, with its fantastical elements more described as supernatural rather than horror, and Talbot’s art is a pleasant change of pace from the usual American comics style. It’s more refined and…quaint and really applies to the story being told.